A young mum has issued a warning to other parents after online conmen posted a picture of her son on social media claiming he was missing. Tricia Greene from Gaoth Dobhair was left shocked when she saw a poster of her son Callan claiming her was missing. The online appeal went viral and was shared more than four thousand times on Facebook as well as Twitter and Snapchat by concerned members of the public. The bogus poster warned ‘Still no sign of Caolan, if anyone has seen him or sees him can they please get in touch! The campaign, which used an actual picture of Callan, was widely shared in and around the Glasgow area of Scotland. Mum Tricia only found out about the bogus campaign when relatives in Glasgow became concerned about Callan thinking he was missing. 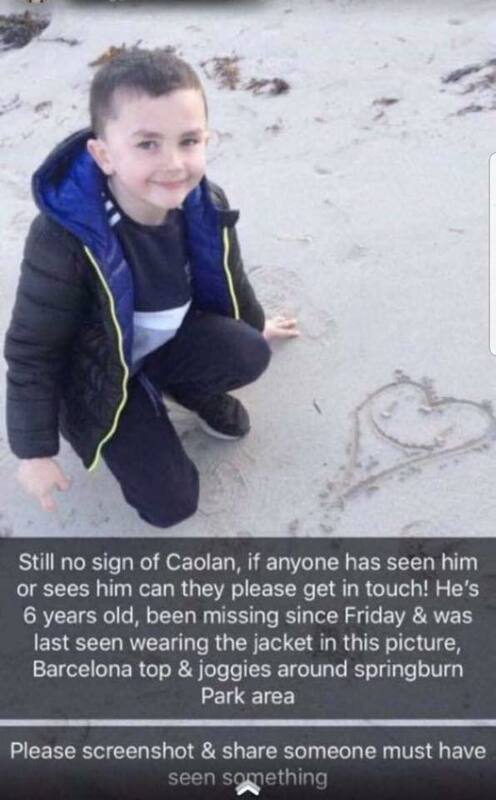 The post which went viral claiming Donegal lad Callan was missing. They contacted Tricia only to find out that Callan was safe and well at home in Donegal. Tricia then spent hours trying to get to the bottom of the bogus online campaign and asking people to delete the message and not to share it anymore. She said she doesn’t know why anybody would do this but said it must have been deliberate if they took a picture of Callan and put an appeal along with it. “I just want to let other parents know that these things can happen. I don’t know why anybody would do such a thing but it certainly gave me a fright. “I might never have known about this but for the fact that I have relatives living in Glasgow and they alerted me to it. “Thankfully Callan has never been missing and that’s all that matters. But I would hate for any other parents to get the fright that I got when I read this,” she said.